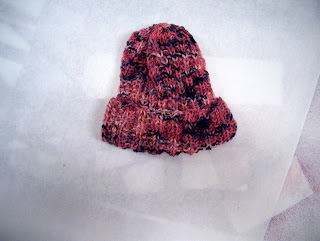 Here's a hat Regina Rooks (you can see her blog here http://rgrdesigns.blogspot.com/) made for me, from hand-dyed wool yarn I purchased seveeral years ago. It'd be perfect for a small childs head. A close up of the batts, click on an image to get an even bigger view. I've been dyeing fibers and making batts for the shop. 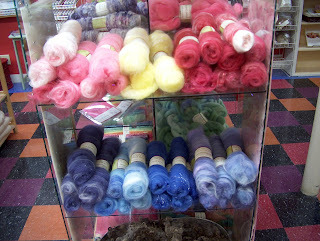 Most of these are blends of silk bombyx sliver, Austrailian wool, and mohair. Some of the batts have angelina in them. 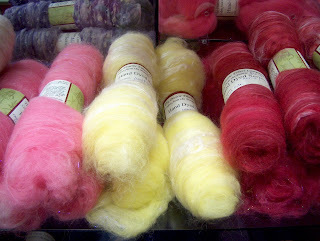 Some are really pretty, I don't have a picture of them will do that tomorrow, pinks and greens, yellows and greens. Using the drum carder makes my back ache.